$3 million for statewide literacy initiatives. kick-started the public phase of the University of Florida College of Education’s capital campaign. His donation of $3 million will support the college’s transformative literacy initiatives aimed at doubling the number of students in Florida who can read proficiently. Catalog this feel-good story by Patterson under non-fiction. Ten of Patterson’s novels have been made into movies, though, and some Hollywood flair was evident at the College of Education’s campaign kickoff celebration that Friday afternoon in the Norman Hall courtyard, where Patterson’s gift was announced. As Education Development Director Brian Danforth was conducting the unrolling of the college’s fundraising goal scroll posted on a courtyard wall, he was distracted by a swelling buzz permeating the supportive throng of education students, faculty, staff, donors and alumni who had gathered. Causing the ruckus was an adrenalized special-delivery messenger—in the form of Special Education Professor Holly Lane—snaking her way through the crowd to reach Danforth before handing over the object of her excitement. Danforth briefly examined the mystery gift and, in mock disbelief but also genuine joy, he cracked a big beautiful smile and held up what turned out to be an oversized replica of a check from Patterson for the amount of his $3 million charitable gift. Danforth’s tone turned serious momentarily as he explained to the cheering (woo-hoo!) EduGator congregation how Patterson and the College of Education share “this very ambitious goal” to double the number of Florida schoolchildren who can read at grade level. Professor Lane, who also directs the college’s School of Special Education, School Psychology and Early Childhood Studies, is a recognized expert in literacy education and interventions and will steer the Patterson-funded literacy initiative. In an interview, Lane said the prolific writer’s gift will ensure that UF’s evidence-based literacy-intervention methods reach many more struggling readers through innovative online professional development for all practicing teachers and school leaders, along with intensive support custom-tailored to meet the needs of individual partnering school districts. UF Education Dean Glenn Good said Patterson’s efforts to improve literacy throughout Florida are well documented “and deeply appreciated by our faculty. 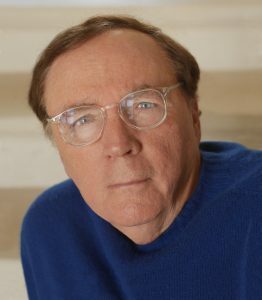 We are excited to partner with James Patterson in his ambitious goal to double the number of students in our state who can read proficiently,” Good said. He is known for his philanthropy supporting higher education, literacy instruction, keeping libraries well stocked, and, of course, book-reading by people of all ages. 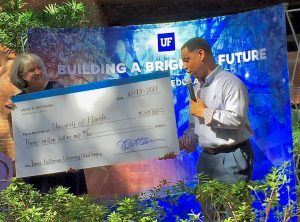 Patterson’s $3 million donation to the college Friday follows on the heels of gifts worth $432,000 that he has made over the past four years to fund 72 scholarships for 21 UF teacher prep students with a strong interest in reading instruction. Each year the Patterson Family Foundation awards scholarships to students in various fields at 22 different colleges and universities around the country. That includes several dozen James Patterson Teacher Education Scholarships, like those at UF, for education students who are committed to teaching careers. The College of Education’s fundraising goal in the seven-year capital campaign is $55 million. The college’s kickoff celebration Friday afternoon was to be followed by the University of Florida’s kickoff celebration of its uber-ambitious $3 billion campaign Friday evening at 7:30 at the Stephen C. O’Connell Center.